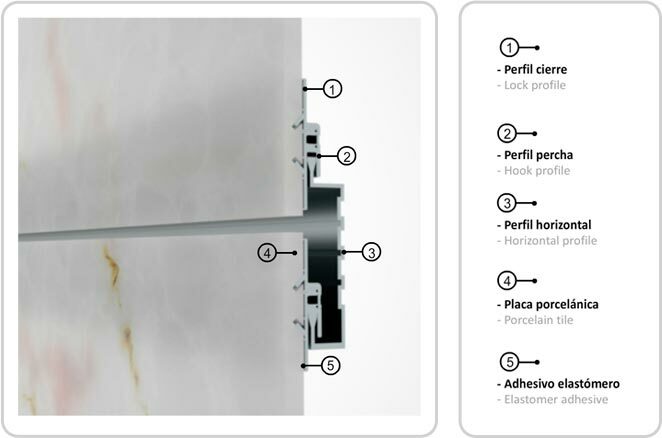 The Rediwa C.A.T 1 system is a mixed hidden longitudinal fastening system (chemical and mechanical), which works by the compression exerted by the system on the back of the ceramic tile. These tiles are industrially mechanised in a longitudinal way at the top and bottom of its back with a double 45º groove in the shape of a dovetail where a couple of aluminium profiles are inserted and fixed with an MS adhesive putty, to make the ceramic tile safer. These metal profiles make up the hanging mechanism of the tiles and are noteworthy in that they are very easy to replace. This aluminium set will become indivisible because of the way of mechanising the tile and fixing the profiles. This system eliminates the risk that the ceramic parts will become detached if they are broken which is why this is considered the safest system on the market. Furthermore, the way in which the ceramic tiles are hung on the horizontal structure provides for perfect planimetry and a perfect aesthetic finish. The Rediwa C.A.T 1 system also means that tiles can be replaced if necessary.